What is the range of values for a (sp3)C-C(sp3) single bond length? Predicted properties of a candidate for a frozen semibullvalene. Frozen Semibullvalene: a holy grail (and a bis-homoaromatic molecule). 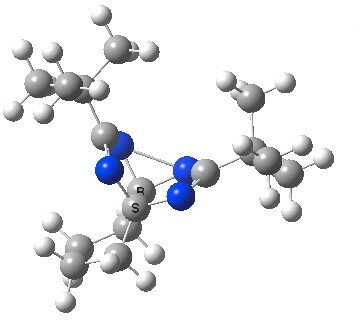 Semibullvalene is an unsettling molecule. Whilst it has a classical structure describable by a combination of Lewis-style two electron and four electron bonds, its NMR behaviour reveals it to be highly fluxional. This means that even at low temperatures, the position of these two-electron bonds rapidly shifts in the equilibrium shown below. Nevertheless, this dynamic behaviour can be frozen out at sufficiently low temperatures. But the barrier was sufficiently low that a challenge was set; could one achieve a system in which the barrier was removed entirely, to freeze out the coordinates of the molecule into a structure where the transition state (shown at the top) became instead a true minimum (bottom)? A similar challenge had been set for freezing out the transition state for the Sn2 reaction into a minimum, the topic also of a more recent post here. Here I explore how close we might be to achieving inversion of the semibullvalene [3,3] sigmatropic potential. Why might such a frozen transition state be interesting? Well, all transition states for allowed thermal pericyclic reactions can be described as aromatic. If one were able to transmogrify such a transition state into a minimum, then it too would be expected to be aromatic, but a most unusual type of aromatic. The C-C bonds which represent the breaking and forming bonds in a [3,3] sigmatropic rearrangement would in effect be two-centre 1-electron bonds, and those electrons would be part of the aromatic sextet. 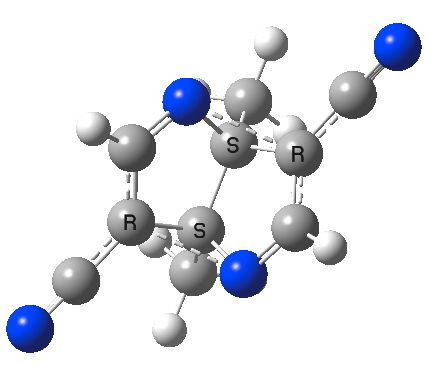 Such bonds are normally referred to as homoaromatic, examples of which are pretty rare. In my previous post, I had noted a crystal structure that apparently sustains two equal C-C bonds of length 1.99Å. However, a calculation at this geometry reveals it in fact to be a transition state (above, top), with an imaginary mode of 275i cm-1. So the challenge (computationally at least) is to find a system where this imaginary mode is changed to become real rather than imaginary. CAZFUE. Click for animation of imaginary transition state mode. My effort to achieve this involved augmenting CAZFUE with a further two cyano groups. This did indeed reduce the imaginary mode to 74i cm-1; we are getting close! Tetracyano derivative of CAZFUE. Click for animation. The next step was to read a recent article in which replacing the key C-C bond with a C-N bond was observed to reduce the barrier for the rearrangement to ~ 4 kcal/mol. So I immediately computed the tetra-azo system, in which the two key C-C bonds are now replaced by N-N bonds in order to extend this effect. Tetra-azo semibullvalene. Click for animation of key frozen mode. It was gratifying to observe that the [3,3] sigmatropic vibration, imaginary (i.e. corresponding to a transition state) in the previous examples, became +ve (+238 cm-1) in this system. 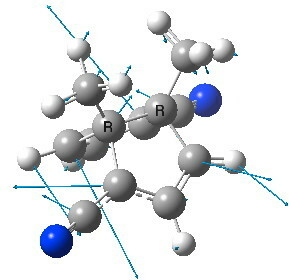 The two N-N bonds are however not completely symmetric (2.06 and 2.17Å), but they are in effect essentially frozen at the half-way stage of the equilibrium. The final step in this path is to combine the two effects above, by exploring the di-cyano-diaza derivative. Di-cyano, diazo derivative. Click for 3D. This now has C2 (chiral) exact two-fold symmetry, with C-N distances of 2.139Å. The [3,3] sigmatropic vibrational mode is again real, with a value of 255 cm-1. A real candidate for synthesis perhaps? Finally, is it aromatic? The wavefunction for this system is stable (which means no triplet state lower in energy can be found), so it stands a good chance of being so. I will report back on this aspect in a later post. Postscript: The above calculation for the last system was done at the B3LYP/6-311G(d,p)/SCRF=thf level. A similar result is obtained at e.g. a MP2/6-311G(d,p)/SCRF=thf level; the [3,3] vibrational mode has the real value of 318 cm-1. This entry was posted on Saturday, September 15th, 2012 at 6:28 pm and is filed under Interesting chemistry. You can follow any responses to this entry through the RSS 2.0 feed. You can leave a response, or trackback from your own site. To my mind, NICS crirerion support some aromaticity of the nonclassical structure of di-cyano-diaza derivative. Very nice! Thanks for doing this calculation! Now, is there anyone out there who would like to try a synthesis? My prediction is that as a non-classical bis-homoaromatic, the colour will be purple. 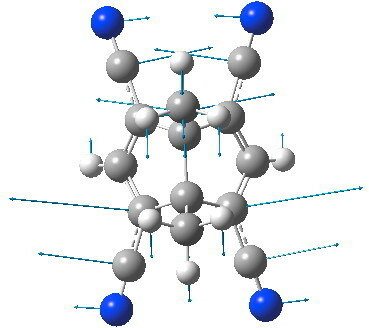 Frozen Semibullvalene: a holy grail (and a bis-homoaromatic molecule). is licensed by Henry Rzepa under a Creative Commons Attribution-Noncommercial-Share Alike 3.0 United States License.